I'm excited to announce that I will be debuting a new set of collaborative prints at this year's Punk Rock Flea Market, put on every year by the amazing R5 productions. 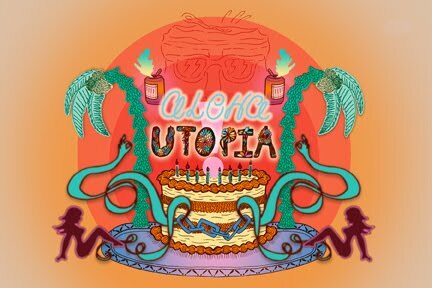 I have been drawing and collaborating steadily with my friend Jen Gin on some drawings, for a project we are calling ALOHA UTOPIA! The Punk Rock Flea Market will be held in a warehouse across the street from the Starlight Ballroom (exact address is 461 n. 9th street) on December 11th (Sunday) from 10:00 am to 5:00 pm. I think its like $3 to get in. 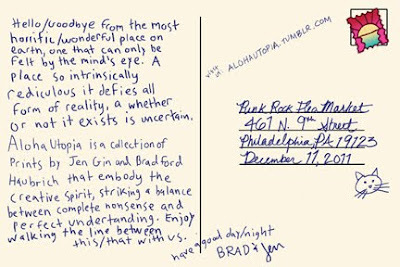 "Hello/Goodbye from the most horrific/wonderful place on earth, one that can only be felt by the mind’s eye. A place so intrinsically ridiculous it defies all form of reality, and whether or not it exists is uncertain. Aloha Utopia is a collection of prints by Jen Gin and Bradford Haubrich that embody the creative spirit, striking a balance between complete nonsense and perfect understanding. Enjoy walking the line between this/that with us.